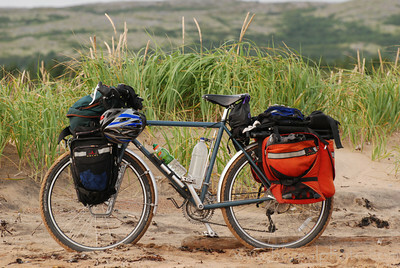 "I'd been looking for a steel touring frame with 26' wheels for a while. They were few and even when the surly frames came out, the cost of building it would be almost the same as a complete Bruce Gordon Rock Road or some other custom bike. Then came the Surly Long Haul Trucker complete. All I had to do is convince myself that the 'color isn't so bad in real'. Yeah right, it's still ugly but at that price, the LHT is one of the best bang for the buck so buying an expensive bike and staying home looking at the expensive paint job was no longer an excuse"